2006 Benjamin Franklin Coin & Chronicles set. Set is unopened just as it came from the mint. 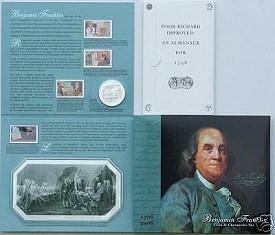 This limited-edition set includes a "Scientist" uncirculated silver dollar; a set of four newly released U.S. postage stamps honoring Benjamin Franklin's many accomplishments; a reproduction of the 1758 edition of Poor Richard's Almanack; and an intaglio print from the Bureau of Engraving and Printing honoring Franklin's role in the creation of the Declaration of Independence.